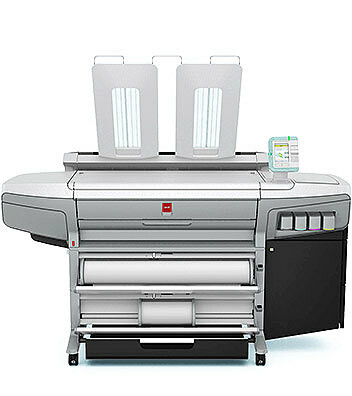 The Océ ColorWave 300 wide format printer is a single-footprint all-in-one color and black and white print/copy/scan machine that is designed to grow with your business to meet all your color and monochrome large format printing needs. All-in-one single footprint color printer, copier and color scanner with 1 or 2 rolls. Get the ease and efficiency of an Océ black and white large format printing system with the versatility of a color printer. Print efficiently with print speeds of 41 sec/E size in monochrome and 63/E size in color. Eliminate waste with automatic original and media size recognition and image positioning features to avoid misprints. Maintain a clean working environment unaffected by ozone, dust and odors. Cut your current large format copier electricity consumption by at least 50%.